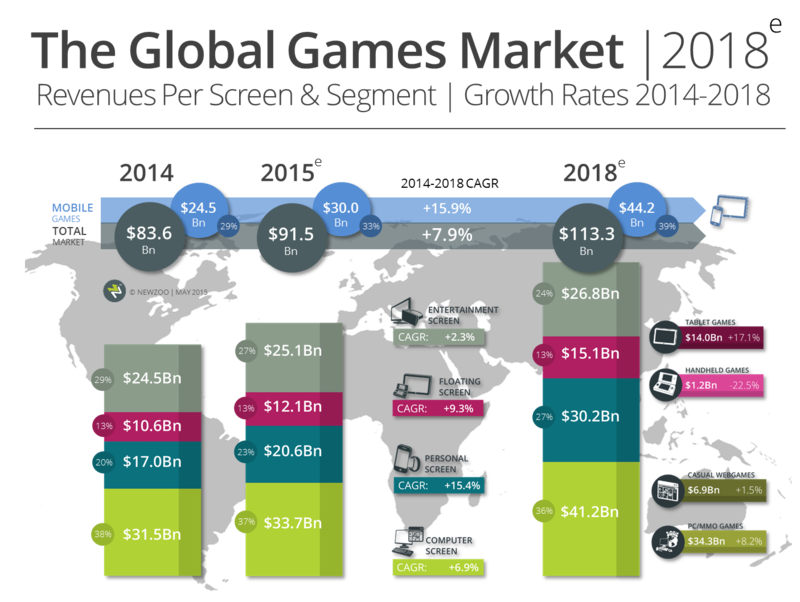 Games research firm Newzoo has released several key data points from its upcoming 2015 Global Games Market Report, which notes that the worldwide games market will reach $113.3 billion by 2018, representing a compound annual growth rate of 7.9 percent from 2014. Importantly, Newzoo points out that the US and China together will account for half of the entire global games market in 2018. While China and the US are nearly even now, by 2018 China will grow to $32.8 billion, far surpassing the US, which will reach $24.1 billion. The biggest difference is in digital sales and mobile growth. Already this year in China, digital games revenues will account for 97 percent of the total games market, compared to 72 percent in the US. Newzoo says the US mobile market is "showing signs of maturing" but China's has room for more growth. For example, this year in the US, smartphone games and tablet games are expected to see year-over-year growths of 13.4 percent and 17.8 percent, respectively. In China, however, smartphone games will grow 50 percent as tablet games grow 39 percent. While mobile's massive impact is undeniable, it's actually the PC screen that will remain the most dominant, Newzoo reports. By 2018, the PC/Mac will account for $41.2 billion of global game revenues, or about 36 percent of the total. It will continue to be the most revenue generating screen, with a CAGR of +6.9 percent. The Entertainment Screen (Newzoo's category for TV/Console and VR), meanwhile will drop from 27 percent to 24 percent of the market with $26.8 billion by 2018. Additionally, both the Computer Screen and Entertainment Screen categories will lose a portion of their share to the Personal Screen (Phones, Smartwatches). The Personal Screen will also account for 27 percent of the pie ($30.2 billion) in 2018, with the last 13 percent of the market going to the Floating Screen (tablets and handhelds). Even though Nintendo has been successful with the 3DS, dedicated handhelds continue to be in decline. This decline, which Newzoo says is roughly -22.5 percent CAGR, is partially offset by the growth of tablet game revenues, which have a 17.1 percent CAGR. One should be careful at aiming their targeted customers, as per capita spending is still very low here in China. Foreign companies can still succeed here, but you need to offer really good quality games/services like World of Warcraft, League of Legends and DOTA series. The growth predicted by Newzoo will only hold up if the current trend continues, but 3 years in the industry is a very long time.